On An Overgrown Path: How many black conductors at the BBC Proms? How many black conductors at the BBC Proms? The separate paths of BBC Proms and black conductors have been the hot topics here recently. Now they converge in this question - how many black conductors have appeared at the BBC Proms and Henry Wood Promenade Concerts during their 117 year history? It is not a rhetorical question as I do not have a definitive answer and therefore would welcome collaborative input from readers. One definitely has, Wayne Marshall conducted Porgy and Bess in the 1998 season. But have any other black conductors appeared at the Proms? Rudolph Dunbar, Dean Dixon, Everett Lee and James Frazier did not, while James DePriest, Paul Freeman, Isaiah Jackson, Kwamé Ryan, John McLaughlin Williams, Tania León and others to date have not; but I may have missed someone. Just as a benchmark, Charles Hazlewood has so far conducted two evening BBC Proms and four daytime concerts. My header photo shows Kwamé Ryan and you can read more about him here. Didn't Bobby Mcferrin conduct a Prom by the Vienna Phil about 10 years ago? Gavin, many thanks and you are quite right - it was 2003. I looked for information on a black conductor I don't think has yet been mentioned in the discussion of the past few days -- Henry Lewis. He did fine work, as I recall hearing discussed somewhere not long ago, building the New Jersey Symphony, and conducted at the Met. It was my thought that he might have been on the podium at the Proms if his wife, later ex-wife but still close friend, Marilyn Horne were performing. A shame one has to think in such a way, but still. I could find no mention of him conducting there, and hardly any mention at all. His Wikipedia entry is a stub, with no notes or external references, and otherwise I noted in passing one recording, accompanying the Gershwin Concerto in F, and mentions as Horne's husband. In fact I did check his name against the Proms database for this post, without a result, but really should have included him in the text - apologies. Henry Lewis's recording of Meyerbeer's Le Prophète, with his wife Marilyn Horne in the cast (also Renata Scotto, James McCracken, and Jules Bastin, so it was quite a starry line-up), appeared in 1977 and is still available on CD. I've not heard it. 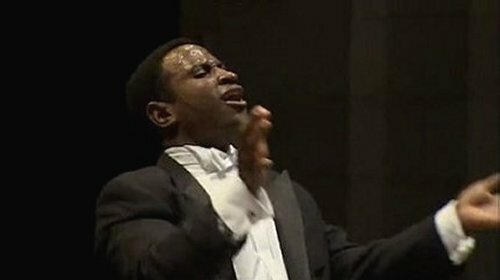 Previous comments on this website have referred to another notable black conductor, Dean Dixon. A fair amount of hitherto unsuspected (and commendable) recorded material is emerging from Australian broadcasting archives these days, so we might yet find that Dixon's 1964-67 tenure with the Sydney Symphony Orchestra will be commemorated on a deserving CD reissue or two.